One of the most common faults which I find in small scale armor kits is poor decals. Very few kits come with decals which I consider high quality, such as one can find in large scale armor models, and aircraft models of all scales. Plus, the vast majority of resin kits don't come with any decals at all. With few, if any, after-market companies making decals for us 1/72nd scale armor modelers, this puts us in a horrible position when it comes to finding adequate markings for our models. So I was extremely happy to find these new decals from Attack Hobby Kits, designed for use on tanks from the minor Axis powers. The decals are very thin and well printed. However, the yellow ink was printed out of register, which ruined the Romanian air identity insignia. 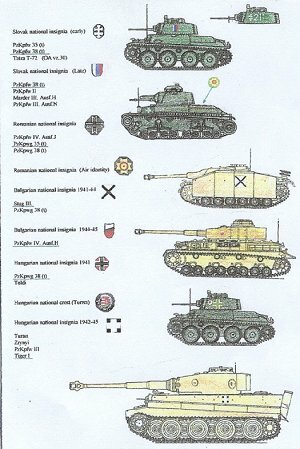 Late Hungarian National Insignia (Turan, Zrynyi, Pz III, Tiger I).